Alex and I at Lehmann Maupin in her newest solo show "Face in the Crowd"
I became acquainted with Alex Prager's highly cinematic photographs about five years ago and I immediately knew she was on to something big. The saturated colors, the sharpness of the images, the composition of her pieces, and the combination of old Hollywood glamour and timelessness called my attention and that of many others who have been collecting her pieces and following her career all these years. Two days before the opening of her newest solo show at both Lehmann Maupin's New York locations, I interviewed Prager at the Chrystie street location, surrounded by some of her most striking and ambitious pieces created to date. These pieces are being shown concurrently with her solo exhibition at the Corcoran Gallery of Art in Washington DC. MB I'm interested about the process, what goes into creating these highly cinematic; highly produced pieces? 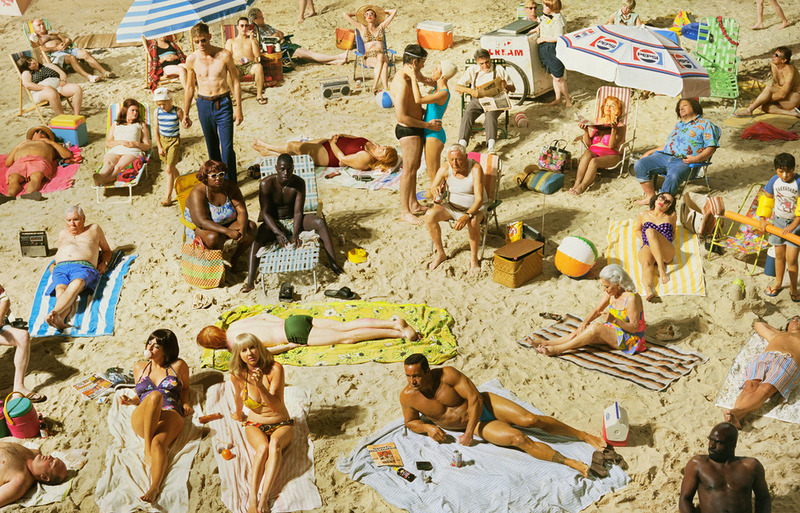 I'm particularly drawn to this beach (a piece that is hung on its own on the back wall of Lehmann Maupin's Chrystie Street location called Crowd #3 (Pelican Beach) and which measures 60 x 93 inches); it must take an enormous amount of time to create. AP We decided to do this one first because it was the hardest one. All these photographs were produced and shot on sets in LA; we moved 20 tons of sand which is laid out 2 inches deep and there is a huge sandbox around it that keeps the sand in place. The process is long because there are weeks of pre-production. My studio will gather pictures of the characters and we will have all these head shots hanging up, so I'm familiar with each of them. A lot of them are my friends and family, like my sister and her boyfriend. My godson is in it too and so are two of my very good friends, the rest are professional extras. Then we pick all the outfits, even before we are on set. I took props from my studio and costume houses, thrift shops and vintage stores -- I wanted to add old and new, so I put mustaches on people, recreated fake tans with makeup. I wanted to show a very accurate representation of the all-American typical beach. After that, the prop stylist and I get together and I sketch up what I want the beach to look like, and she will get all the materials that are necessary to build it, and then once we are all on the set and the beach is set up the way I showed the prop stylist in my diagram, I move things around to accomplish what I envisioned. MB Where are you with your camera once everything and everyone is in place? AP I'm about 30 feet up on a cherry picker and I start directing people and telling them what to do, like the guy who is with the beer bottle in his hands -- I asked him to not drink it, but he drank it anyway. And I asked another guy to wear a speedo and he was thrilled because he had brought a collection of ten different suits. I asked the woman on the back to be a snob and pretend she was better than anyone else on the beach; I asked the African American couple to be in an argument, and the two girls up front, my two close friends, I asked the one to the left to be annoyed at the one on the right who is about to light a cigarette. Alex explaining to me what goes behind the creation of Crowd # 7 (Bob Hope Airport). MB The first time I saw your work four years ago, I thought the photographs looked like movies -- you have your own take but your audience has a different interpretation. Contemporary art is the art that defines us as individuals and as a society and I'd like to know what would you think is your major contribution to society? AP These are very unique pieces coming from me and the productions are big and complicated and very hard to copy. This is how I see the world, it's my vision of the people I see in NYC or LA; this is work that's coming from me in a pure form and it can be very inspiring to show that unique point of view. Also, I hope that through my art people will notice more those I portray as characters. Sometimes the media paints a very narrow-minded idea of beauty, and this piece shows an entirely different side of what beauty could be and it's also a very lively and colorful photograph. MB As a self-taught artist you took that camera and start doing what you do best and I think you were born with a gift, it's on your DNA. AP Yes, I feel I would not have had the patience to go to art school. I wanted to start taking my pictures immediately the way I think they should be. I'm amazed by all the sets she created and the enormous amount of details in each photograph. Here we go over Crowd #11 (Cedar and Broad Street). MB I always say that I'm not sure whether collectors are completely aware that when they acquire an artwork they will also take home a piece of the artist's soul and that is so powerful. And yes, I know how important and prestigious the museum show is and how much impulse it gives to any artist's career to have a solo show in a museum or to be part of a group show, but the level of engagement is never the same as if you were to live with that piece. You have accomplished so much in the past three years and your career is growing in leaps and bounds. How do you feel about all of the success you've had recently? AP I didn't think so much about this side, my focus is on the next project and I'm thinking about how to accomplish it and how to overcome challenges to produce the next body of work. Of course the press, the support of the collectors, the museum shows, all that makes life nicer and it feels great to be acknowledged, but this is all happening on the outskirts of my work. And it is so nice to meet collectors and know people like you who has seen the track of my older work four or five years ago, even though we had never met before we connected that way -- that is really amazing. MB Will you be playing with different media in the future? AP Yes I will. I never expected to be making films. That was a big surprise for me, because since the moment I found photography, I thought I was a photographer. Then the films opened this whole new medium for me that feels so organic, and since then I knew that I wouldn't want to say no to anything. And who knows if in five years I want to be doing this massive performance piece. MB What's your dream collaboration? AP: I think Doug Aitken is doing amazing things right now. MB And he is an Angeleno too! AP Yes! I met him recently and he is doing very cool stuff totally different from what I do. MB Now you got me excited! AP Ha! Let me talk to him first! 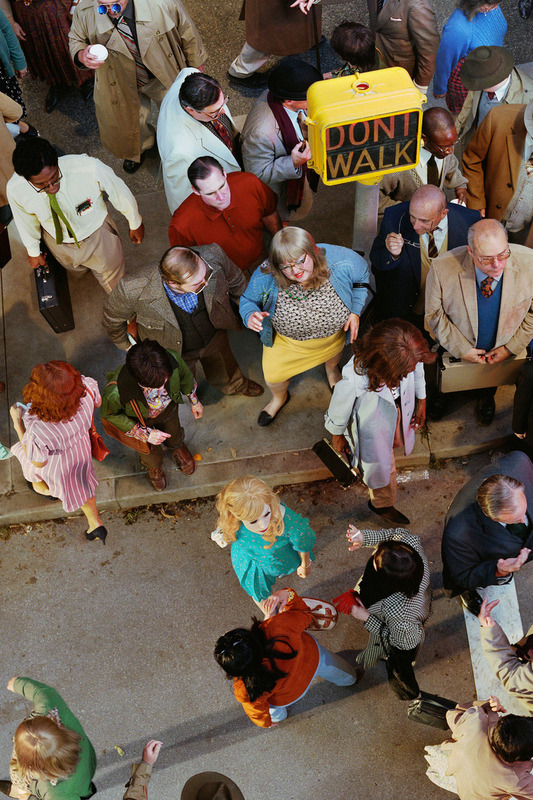 Face in the Crowd opens on Thursday, January 9, at Lehmann Maupin's 540 West 26th Street and 201 Chrystie Street locations and will run until February 22, 2014.